Body composition measurements provide individuals with an estimate of fat-free mass relative to fat mass in the body. Several methods are currently being used by practitioners today: Skin Fold Techniques, Bioelectrical Impedance, Body Mass Index, Near-Infrared, Hydrostatic Weighing, Dual Energy X-Ray and Circumference Measurements. For convenience and practically, skin folds, bio-impedance, body mass index and circumference measurements are the most commonly used methods employed in the health and fitness industry today. Skin Fold Techniques measure the thickness of subcutaneous fat on various sites of the body. The measurements obtained are converted into an equation to predict percent body fat and lean mass. Skin-fold techniques are quick, noninvasive and inexpensive, but the accuracy and reliability of using this method can vary based on the technician’s skill, type of caliper being used and precision in measurement. Bio-Impedance (BIA) is a noninvasive, easy and fast way to estimate body composition. Individuals simply stand on a BIA device, or hold a BIA device that passes a low dose, single frequency current through the body. BIA measures the body water’s resistance to that electrical current. An individual with a greater percentage of body fat will have a greater resistance (slower flow) of current than a person with less body fat. Lean tissue, muscle, has a greater percentage of water and can conduct an electrical current faster than fat. Body Mass Index is a number based on a person’s height and weight. BMI is noninvasive, quick and easy, but the standard error of estimate exceeds 5%. To avoid confusion, BMI does not offer a % of fat. It is a calculated number correlated to being “overweight” or “underweight”. Circumferences measure distances (inches or centimeters) around certain parts of the body: Arms, Legs, Chest, Waist, Hips, Buttocks, and Neck. Like skin folds, circumference values can be used in equations to predict percent fat or whole body density. This method is a great way for practitioners monitor site-specific reduction, but is not as accurate as Skin Folds or Bio-Impedance. Iverson Fitness and Wellness Consulting uses a comparative approach to body composition analysis by incorporating several of the most common methods listed above. Our bio-impedance analysis retains excellent reliability and accuracy, followed by circumference measurements for site-specific comparison. New % fat health standards for men and women. Continuing with my topic on the Top Ten Questions Most Commonly Asked as a personal trainer, exercise and nutrition consultant, here are five more teasers to Test your Diet, Exercise and Nutrition IQ. True or False: A person trying to lose body fat should stick to cardiovascular exercise. True or False: Taking extra vitamins will help pep you up if you are fatigued. True or False: There is good scientific evidence that caffeine is safe when consumed in moderation. True or False: Athletes need more protein in their diets than the general population. True or False: A day-long fast now and then is a good way to cleanse your body and possibly lose some weight. False: Both cardiovascular exercise and resistance training are essential for maximizing body fat reduction. Cardiovascular activities commonly referred to as “aerobic exercise” require a sustained use of oxygen over a prolonged period of time and do prompt fat burning at the cellular level. Resistance training exercises burn fat through anaerobic pathways. Anaerobic pathways are not reliant on sustained activity, but still burn fat calories at the cell level. False: The use of vitamin supplementation is so prevalent today that there is now a wide acceptance of the benefits for consumers. Yes, vitamins are essential to our daily nutrition for metabolic processes, but taking extra vitamins – mega dosing – will not pep you up unless the vitamin supplement has been compounded with some form of stimulant. Vitamin B, in particular, is a water soluble vitamin known for energy metabolism. Some individuals report less fatigue when taking a supplemental B complex according to recommended dosing, but not when mega dosing. Any excess above and beyond what the body can absorb and use will be removed by the kidney and excreted as waste. True: There are several studies that indicate caffeine may improve endurance and enhance performance when consumed in moderation. The beneficial effect of caffeine lies with its ability to increase the release of fatty acids for oxidation and transport during work. Too much caffeine, however, is accompanied by increased diuresis, agitation and nervousness. True: Current recommendations for protein intake in the general population range from 10% to 35%, or 1.8 grams per kilogram of body weight. Athletes and body builders, depending on the frequency, intensity and duration of work, may require up to 50% more protein than sedentary counterparts. Although protein is needed for muscle growth, maintenance and repair, eating more protein will not help you build more muscle. The only way to build more muscle is with exercise! True: Fasting for a day can give your digestive system a break and allow your body to rid itself of toxins and possibly lose some weight if the fast is conducted in a safe and effective manner. If you have any issues with blood sugar, it is safer to choose a juice fast or clear broth fast over a total elimination fast. If you decide on a fast and do lose some body weight, it will most likely have come from water or stool elimination over body fat loss. The intention of a fast should remain with purification (physiologically or spiritual) and cleansing within the body over starvation for weight loss. As a personal trainer and fitness coach, I am continually presented with questions about diet, exercise and nutrition. Most are related to fact or fiction. Something they have been told, heard of or read about in the media network. To clear up some of the confusion, I decided to present a two-part series on the Top 10 Most Commonly Asked Questions I receive from my clients, family and friends. To make it interesting, you’ll get a first hand chance to answer the questions before the truths revealed. True or False: When the body stops exercising regularly, muscle turns to fat. True or False: Exercising specific parts of the body will reduce fat in those areas. True or False: Low cholesterol foods are also low in saturated fat. True or False: A person can safely lose 20 pounds in two weeks. True or False: “Sugar Free” means there is not sugar in the product. False: Muscle and fat are two different types of tissue. Smooth muscle tissue is found in the vascular system, cardiac muscle in the heart and skeletal muscle tissue around the bones and connective tissue. Skeletal muscle can contract, extend, maintain tone, grow in size (hypertrophy), become stronger with use, or deteriorate in size, strength and tone with disuse (atrophy). Muscle fibers, however, cannot turn into a fat cell. The distribution of muscle fibers and fat cells we have is genetically determined. False: Exercising specific parts of the body can strengthen and tone the muscles in those areas, but it cannot reduce the number of fat cells located in a target area. Fat cells can and do shrink with a proper combination of diet and exercise, but the cell itself will not disappear from the genetically positioned spot. False: A product that is low is cholesterol doesn’t mean it is also low in fat or low in saturated fats which, if consumed in abundance, can contribute to increased blood cholesterol levels. Although it sounds confusing, I distinguish cholesterol from fat with a word association. Cholesterol is a sterol, fat (technically referred to as a lipid) is composed of fatty acids. All fats contain three types of fatty acids – monounsaturated, polyunsaturated and saturated. Butter, Coconut Oil, Lard, Palm Oil (things that are solid at room temperature) are high in saturated fatty acids. These are the food items that can contribute to increased blood cholesterol. Corn Oil, Cottonseed Oil, Safflower, Sesame, Soybean and Sunflower Oil are high in polyunsaturated fatty acids which can help lower blood cholesterol and reduce the risk of heart disease. False: A person who tells you they have safely lost 20 pounds in two weeks simply isn’t telling you the whole truth. Physiologically, if someone has lost that much weight, it is most likely a combination of water and intestinal junk that has accumulated in the system. They could be dehydrated, starving or on a detox diet. The weight lost is not body fat. To safely lose one pound of body fat, a person needs to burn or expend 3,500 calories. To lose 1.5 pounds of body fat, they would need to burn 5,250 calories. Now imagine 20 pounds in two weeks. That is 70,000 calories expended in 14 days. Highly unlikely and very unsafe. False: Beware of labels that contain the words sugar free. It only means there is no sucrose in the product. Other forms of sweeteners include: honey, maltose, fructose, corn syrup, molasses, dextrose and sorbitol. These substitutes are not necessarily better than sugar. They are all carbohydrates which contain 4 calories per gram and offer the same insulin spike as regular sugar. If you are trying to cut back on sugar for health issues or weight loss, make sure you carefully read the food label first. It’s not exactly a new strategy for aiding weight loss, but if you aren’t currently using food journals to try to shed pounds, recent research suggests that perhaps you should be. Scientists from the Fred Hutchinson Cancer Research Center summarized the following from their study, which appeared in the July 16 online edition of the Journal of the Academy of Nutrition and Dietetics: women who want to lose weight should faithfully keep a food journal and should avoid skipping meals and eating in restaurants—especially at lunch. Women who kept food journals consistently lost about 6 more pounds than those who did not. Women who reported skipping meals lost almost 8 fewer pounds than women who did not. Women who ate out for lunch at least weekly lost on average 5 fewer pounds than those who ate out less frequently. “For individuals who are trying to lose weight, the No. 1 piece of advice based on these study results would be to keep a food journal to help meet daily calorie goals. It is difficult to make changes to your diet when you are not paying close attention to what you are eating,” said McTiernan, director of the Hutchinson Center’s Prevention Center and a member of its Public Health Sciences Division. 1. Be honest. Record everything you eat. 2. Be accurate. Measure portions and read labels. 3. Be complete. Include details such as how the food was prepared and which toppings or condiments you added. 4. Be consistent. Always carry your food diary with you or use a diet-tracking application on your smartphone. Complements of IDEA Health & Fitness Association. With all the artificial sweeteners available, you may find it challenging to separate fact from fiction. In fact, so many new sweeteners have made their way to market that the American Dietetic Association (ADA) released a Position Paper in 2004 to help nutrition experts educate consumers on the health implications of these products! With all this sweet talk, it’s no wonder that you may be confused about which sweeteners to use. Below are responses to health and safety concerns about sweeteners from Jenna A. Bell-Wilson, PhD, RD, LD, assistant professor in medical dietetics at Ohio State University and Susan Hanselman, a medical dietetics student at Ohio State University in pursuit of becoming a registered dietitian. Are foods that contain artificial sweeteners in some ways healthier than those that use natural sugar? Consuming products that contain artificial sweeteners instead of pure sugar can help lower calorie and sugar intake for people with diabetes. Artificial sweeteners enhance the taste of foods and beverages without adding the calories that sugar would provide. However, you do need to use artificial sweeteners judiciously. Many artificially sweetened products, such as hot cocoa mixes, frozen desserts and baked goods, contain empty calories without offering the additional nutritional benefit of pure sugar. Therefore, low or no calories from sugar doesn’t automatically mean that a product is more nutritious. Read food labels to evaluate the overall nutritional value of a food, regardless of whether the sweetener used is natural or artificial. The U.S. Food and Drug Administration (FDA) has issued a list of acceptable food additives, which it calls “generally recognized as safe.” See “Sweet Options” for the artificial sweeteners that meet this standard. 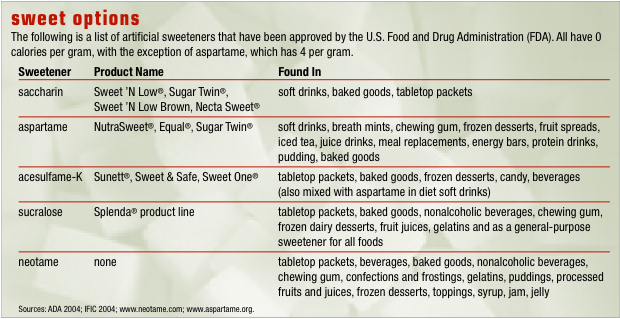 The ADA’s 2004 Position Paper on artificial sweeteners concluded that you can safely enjoy products with these sweeteners in combination with a well-balanced diet. That said, you need to understand that the key is moderation when it comes to any sweetener. The goal should be to eat a varied and balanced diet that includes whole, unprocessed foods. This cannot be achieved if you are focusing solely on foods that contain artificial sweeteners.